“Tiffin-ikku yenna panrathu?” is what my grandmother usually says the second lunch is over at our house in India!. It is translated from tamil as “What shall we make for Tiffin?”. Tiffin is a well known term in the foodie world as a light snack/meal from the Indian subcontinent. My family tell me it’s a term derived from the English slang tiffing, which meant “taking a sip”, but this term is no longer used in the English common language. However like verandah, pyjamas, rickshaw, curry and junk, tiffin is an India-derived noun that now has a permanent place in the current English language; and I feel we should be thankful that this Indo-Anglo word gives rise to such delicious dishes! In South India, Tiffin is often referred to as a snack in between meals or a light dinner. A South Indian Tiffin includes items like, Dosa, Idli, Kozhukattai etc. In North India this term usually means a packed lunch for working men, women and school children and these lunchboxes are known as tiffin carrier or a tiffin box. In Mumbai and other big cities you can’t miss the Tiffinwalla’s carrying many tiffin boxes to various offices and it’s quite amazing to see the technique of carrying so many of these containers all by just one person! In our household, dinner is nearly always light and so tiffin could many different things! One type of South Indian tiffin which is very healthy and fairly quick to prepare is the “Kara Pidi Kozhukattai”. Usually this is made from rice flour or rava (semolina) which is mixed with some tempered spices and then formed into handmade balls. The imprints of the cooks fingers when these balls are made are a special mark of this healthy tiffin 🙂 The balls are then steamed until cooked through and served with either a chutney or a spicy & tangy gravy like “kuzhambu” or “Gotsu/Gojju”. My version of this South Indian tiffin uses Oats instead of rice flour, as well Wheatgerm/bran which are the most nutritious parts of the wheat grain and are not used as much as they could be, in my humble opinion. This tiffin could be made with other additional ingredients like peas, cabbage & carrots is great served hot with a spicy Gotsu/Gojju. ‘Gotsu’ is the term you will hear a lot in Tamil Nadu and ‘Gojju’ is used in Karnataka, but they both mean the same type of dish. They are made slightly differently in different households, and my recipe was passed down to me from my grandmother and mother. 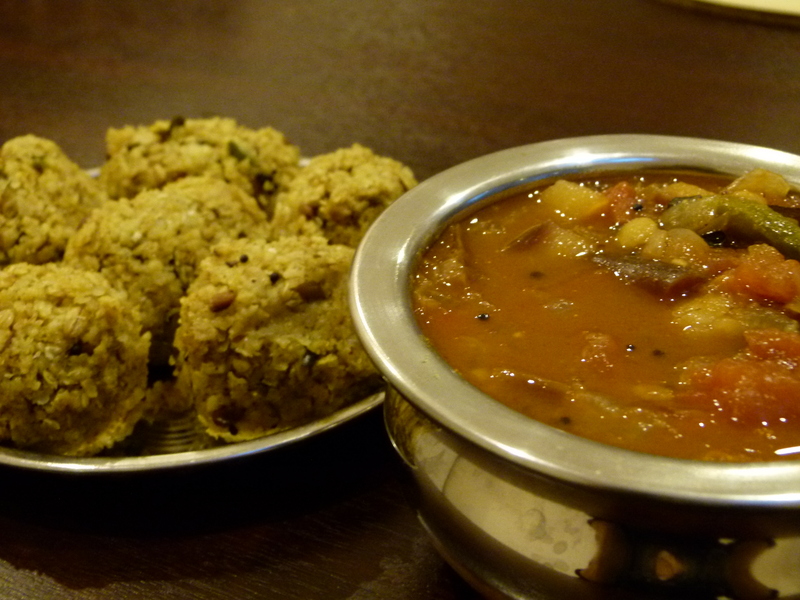 Here are my versions of Oats Pidi Kozhukattai and Gotsu and I hope you enjoy them!